The Attorney General’s Office has overhauled a first draft of a draconian anti-terrorism bill and specified some 14 offences as acts of terror, including joining or attempting to leave the Maldives to join a war in a foreign country. The new draft, submitted to the People’s Majlis on Monday, proposes a jail term of 17-20 years for joining a foreign war. Any individual caught attempting to leave the Maldives with the same intent could be jailed for 10-15 years. The bill also permits extensive surveillance of terror suspects. More than a hundred Maldivians are thought to have left the Maldives to fight with Islamic State and Jabhat Al-Nusra in Syria and Iraq. The two groups are designated as terrorist organizations by the U.S. The government has been struggling to stop the steady outflow of Maldivians joining Jihad. A previous draft of the bill, obtained by Minivan News, granted the president the exclusive authority to declare groups as terrorist organisations. Acts of terror were previously loosely defined. Inciting violence at demonstrations, threatening the country’s independence and sovereignty, and promoting a particular political or religious ideology were considered terrorism. The new bill, however, defines some 14 offences committed with the intent of unduly influencing the government, creating fear, or promoting ‘unlawful’ political and religious ideologies as terrorism. These offences include murder, causing bodily harm, disappearances, kidnapping, damaging property, hijacking vehicles, endangering public health or security, damaging public infrastructure and suspending public services. The president must consult with the national security council in designating groups as terror organisations. The list must be publicised within 15 days of the ratification of the law. Using explosives, bullets or other weapons to cause harm, even if committed without the three motivations of terrorism, is an act of terror. This means gang violence will be considered terrorism. More than 30 people have died in gang violence over the past seven years. Punishments range from 20-25 years for perpetrators. Planning an act of terror is punishable by 17-20 years in jail. Encouraging terrorism with direct or indirect statements is punishable by 10-15 years in jail. Training to commit acts of terror, including learning how to use weapons or joining training camps, is punishable by 12-15 years in jail. “We condemn terrorism. The government aims to mete out the harshest punishments for those who commit such crimes,” the AG office said in a statement. The bill also criminalises possession of dangerous weapons, distributing publications of a terrorist organisation, and forming gangs or groups to commit acts of terror. Fundamental rights, including the right to remain silent and access to a lawyer, can be restricted for terror suspects. Between 6-12 hours is provided to appoint a lawyer before interrogation. Meanwhile, any communications between a suspect and a lawyer for the first 96 hours after arrest must take place in the presence of a police officer. The bill authorises the home minister to apply for a monitoring and control or ‘monicon’ order from the appellate High Court in order to tag, intercept communications and conduct surveillance on suspects. Unlike the first draft, the new bill provides measures that the High Court must consider in issuing a monicon order and establishes some safeguards. 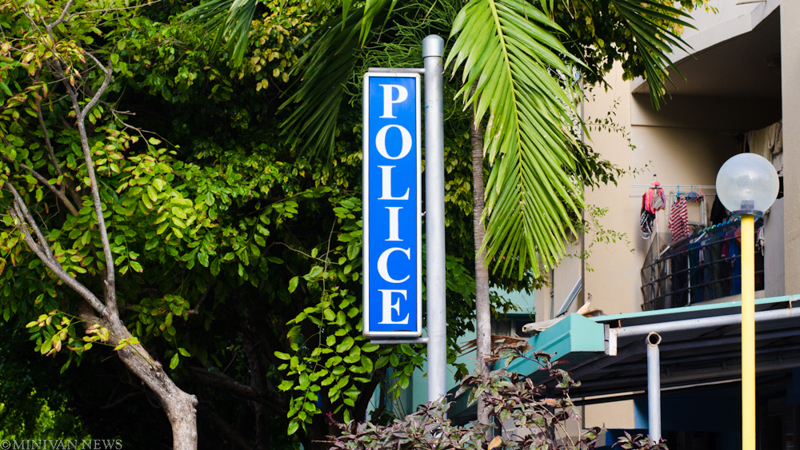 Judges must determine if there is sufficient evidence in a police’s intelligence report against a terror suspect and must determine if the monicon action desired is proportionate to the evidence. If the evidence is insufficient, the court must refrain from issuing the order, the bill states. The minister does not have to inform the suspect and the court is not obliged to summon the suspect before issuing the order. However, the order must be presented to the suspect before it can be enforced. The bill grants a suspect a 90-day period to appeal the monicon order at the High Court. The court is obliged to accept appeals of monicon orders and hold hearings. Monicon orders last for a year and can be extended every year. Orders can be issued against minors. The government can restrict a suspect’s place of residence, freedom of movement and monitor bank account transactions and order a suspect to undergo a rehabilitation programme under a monicon order. If a suspect violates a monicon order, a court can jail or place them under house arrest for 18 months. If the law is passed, the Anti- Terrorism Act of 1990 will be dissolved. Former president Mohamed Nasheed and ex-defence minister Tholhath Ibrahim were charged under the terrorism law over the military’s detention of a judge and sentenced to 13 years and 10 years in prison, respectively, in March. The police have begun conducting random checks on passengers on board flights to Turkey in a bid to deter the growing numbers of Maldivians seeking to join radical Islamic movements in Syria and Iraq. A police spokesperson said the police have been randomly questioning Maldivians en route to Turkey on different airlines for their reasons for flying to Turkey and their return dates. The operation has been ongoing for more than 90 days. The police declined to give additional details. The government has drafted a new anti-terrorism bill that would criminalize the act of leaving the Maldives to participate in foreign wars. The bill, however, also grant the president the exclusive authority to declare groups as terrorist organizations, and also criminalizes the promotion of certain political or religious ideology as a terrorist offense. When reports of Maldivians joining in the Syrian civil-war and dying in battle first surfaced in local media, President Abdulla Yameen said he was not aware of Maldivian participation in foreign wars. In December, home minister Umar Naseer acknowledged the problem of Maldivians fighting in foreign wars, but said only seven Maldivians were active in war. In January, the commissioner of police Hussain Waheed estimated the figure to be more than 50. But the main opposition Maldivian Democratic Party says the figure could be as high as 200. Waheed said that police were monitoring the activities of militants and would reveal details of plans to prevent radicalisation at a later date. The MDP has said the government is doing little to counter radicalisation and prevent recruitment of would-be fighters. Atleast seven Maldivians are reported to have died in Syria. 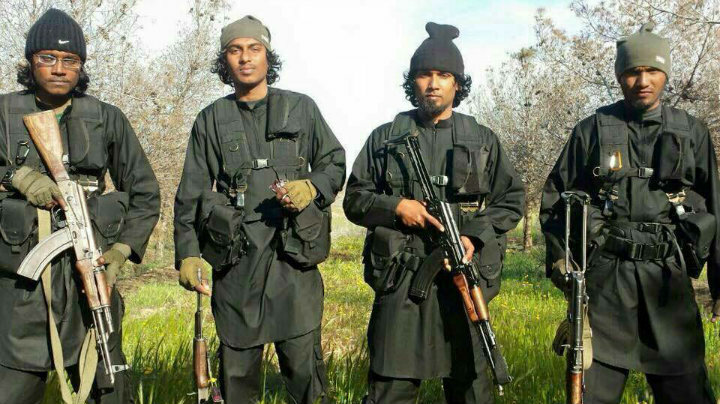 On May 31, newspaper Haveeru said two more Maldivians had been killed while fighting with the Islamic State. Many would-be fighters migrate with their families and children. Several officers of the Department of Immigration are reported to have left the Maldives for jihad. A UN report has raised concerns over an increase in fighters leaving the Maldives to join terrorist organisations including al-Qaida and the Islamic State in Iraq and Syria. The expert report to the UN Security Council, obtained by The Associated Press, said the flow of fighters globally “is higher than it has ever been historically”, increasing from a few thousand a decade ago to over 25,000 from more than 100 nations today. The UN report, written by a UN panel monitoring sanctions against Al-Qaida, listed the Maldives, Finland and Trinidad and Tobago as countries from which numbers of fighters were increasing, while the highest number of foreign fighters come from Tunisia, Morocco, France and Russia. Most fighters travel to Syria and Iraq, to fight primarily for the Islamic State and the Al-Nusra front. A Facebook page had published, the obituary and pictures of Maldivian jihadi Azlif Rauf on May 24, who reportedly died in Syria in mid-May. 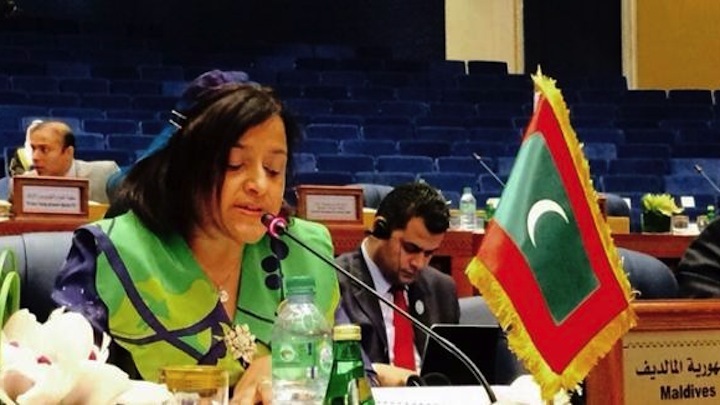 Foreign minister Dunya Maumoon has expressed concern with external actors providing support to radical elements in societies transitioning to democracy. “Radicalism has no place in Islam,” Dunya declared at the 42nd session of the council of foreign ministers of the Organisation of Islamic Cooperation (OIC) in Kuwait. “Nonetheless, in every corner of our Ummah, faces of radicalism stare back at us. It is most distressing to the Maldives that external actors to continue to provide all forms of support to such radical elements, particularly in emerging democracies,” she said in an address delivered on Thursday. 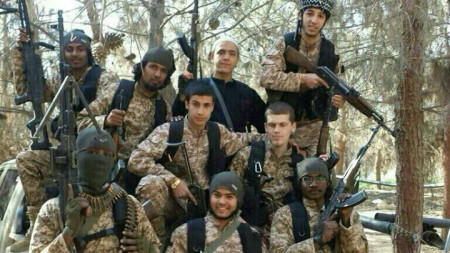 Nearly a dozen Maldivian jihadis have reportedly died in Syria. Since the first reports of Maldivians travelling for jihad surfaced last year, a steady stream of recruits have left the country, including couples and entire families. The government has not previously suggested that foreigners could be involved in recruiting locals. In January, commissioner of police Hussein Waheed estimated over 50 Maldivians could be fighting in foreign civil wars, but the opposition says the figure could be as high as 200. The government has since drafted a new terrorism law that criminalises participation in foreign wars. She also condemned “Israel’s illegal settlements in Palestine” on behalf of the government. “The Maldives calls on countries around the world to support the state of Palestine and to recognise its sovereignty in Palestinian territories,” she said. Dunya said she was “heartened to see an increased number of women colleagues” in the OIC meeting. “Around the world women continue to face hardships. Islam liberated women and elevated their status in society and family. And Muslim countries need to continue with, instead of constraining, the rights of women,” she said. The democratic reform agenda launched in 2004 by her father, former President Maumoon Abdul Gayoom, “has transformed the country into a vibrant multi-party democracy without compromising our Islamic values and heritage,” she continued. “The government of President Yameen is determined to see through the reform process. Islamic civilisation brought revolutionary changes to the systems of governance,” she said. A suspect in the murder of MP Afrasheem Ali, Azlif Rauf, has died while fighting in Syria, his family has claimed. Azlif’s brother wrote on Facebook on Friday that he had “lived like a lion and died as a hero.” The family was reportedly informed of Azlif’s death on Thursday night by Maldivians in Syria. Sources close to the family told Haveeru that the Maldivian jihadis had sent a photo of the dead ex-military officer. However, there has been no independent verification of Azlif’s death and opposition politicians have questioned whether he had gone to Syria. A police media official said the police do not have any information on the case. The police are not investigating any cases involving Azlif at present, the official said. 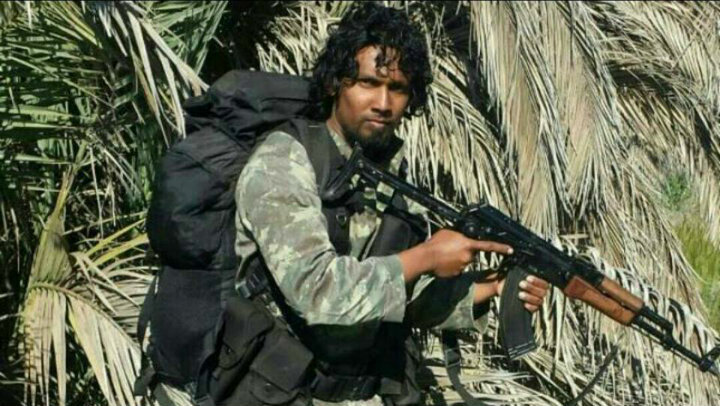 Reliable sources told Minivan News in January that Azlif left to Turkey with six members of Malé’s Kuda Henveiru gang and crossed the border into Syria. Azlif was under house arrest at the time and police had forwarded terrorism charges against him to the prosecutor general’s office in relation to Afrasheem’s murder. However, the PG office had not filed the case at court. In other cases where Maldivians had died in Syria, there was confirmation from credible independent sources as well as reports from jihadist media, the source noted. The death of most Maldivian jihadis were reported by online group Bilad Al Sham Media, which describes itself as “Maldivians in Syria.” The group says it represents Maldivians fighting with the al-Qaeda-affiliated Jabhat al-Nusra militant organisation. The expert also questioned whether Azlif had been radicalised enough to leave for Syria. Another possibility is that Azlif’s “associates here who wished to hide him” were spreading false reports of his death, the expert suggested. 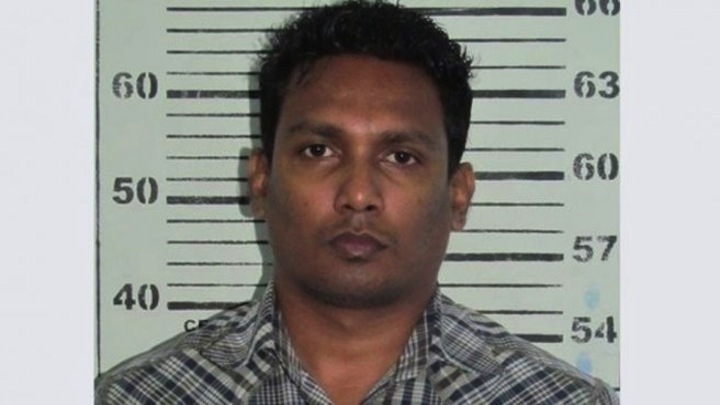 Hussain Humam Ahmed, now serving a life sentence over the murder of Dr Afrasheem, had said Azlif had planned the murder in October 2012. Humam later retracted the confession and claimed it had come under duress. Speaking at an opposition alliance rally on Thursday night, ‘Sandhaanu’ Ahmed Didi alleged that Azlif is hiding in Malaysia. He further alleged that tourism minister Ahmed Adeeb had facilitated Azlif’s departure while he was acting defence minister in early January. After Humam alleged President Abdulla Yameen and Adeeb’s involvement in the murder last month, Adeeb accused the opposition of orchestrating the convict’s remarks in a “character assassination” attempt. A senior police officer has meanwhile told Haveeru that Azlif is in Armenia while other sources claimed he was in Sri Lanka last week. The report also suggested gang leaders had been exposed to radical Islam during incarceration in prison, saying that they openly supported the actions of the Islamic State in Iraq and recruited jihadists for the war in Syria and Iraq. The Maldives police chief Hussein Waheed in January estimated some 50 Maldivians are fighting in foreign wars, but the main opposition Maldivian Democratic Party says the figure could be as high as 200. Waheed’s comments came after reports of at least 13 Maldivians leaving for jihad surfaced in local media in early January. Since then, at least four more have traveled to the Middle East. 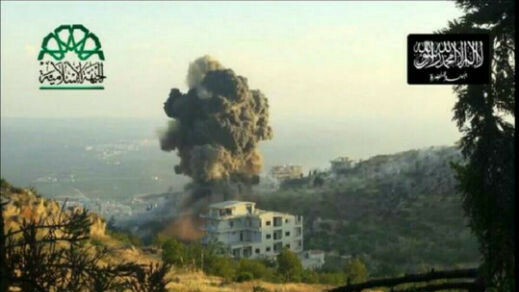 Some seven Maldivians are reported to have died in the past year during battle in Syria, according to local media.